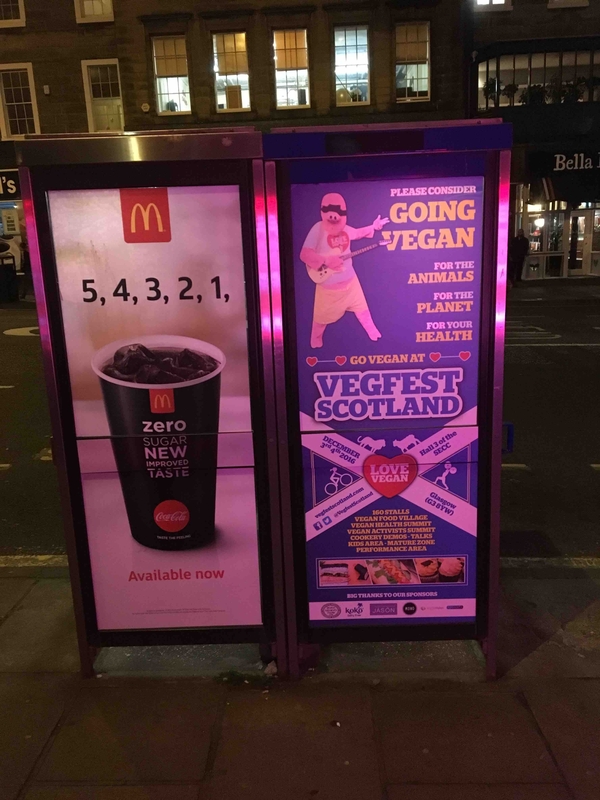 A number of posters with a clear ‘go vegan’ message have been spotted on phone boxes in Edinburgh near the event sites for the world-famous Edinburgh International Fringe festival. The posters are up in prime spots for the whole of August, meaning that they will be seen by around 1 million people during the festival period. 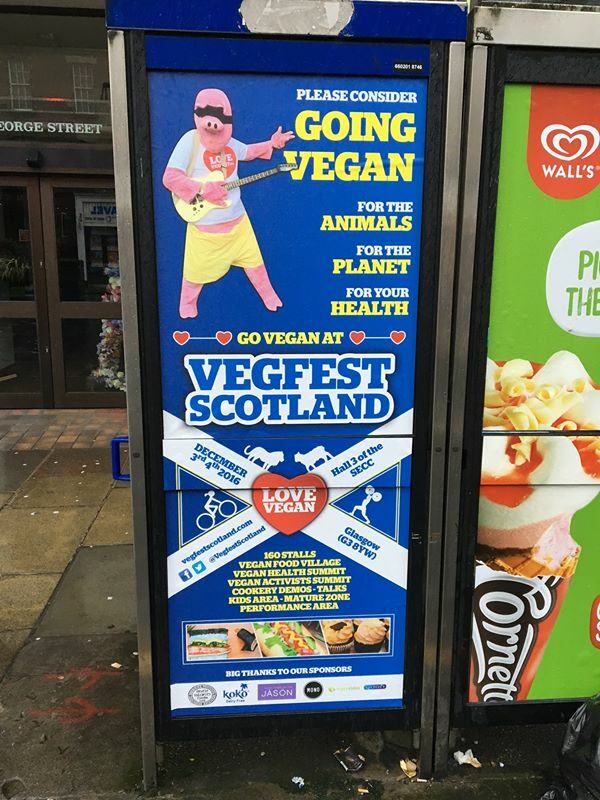 Starring pink fluffy pig Pig Freud, the phone box posters ask people to go vegan for the animals, for the planet and for their health, inviting people to attend the upcoming Vegfest Scotland event in Glasgow on December 3rd 4th at the SEC Centre. Pig Freud is the world’s 1st guitar-playing pig and also known as the thinking pig’s pig. He lives to promote veganism through his music. He embarked upon his first tour of the UK in Autumn 2015, performing at 5 different vegan festivals and collecting over £3,600 for 5 nominated grassroots volunteer-led vegan projects worldwide in the process. 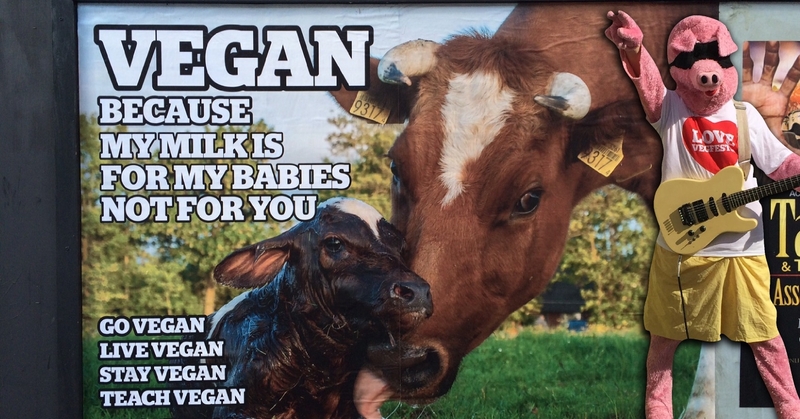 Pig Freud also launched his own vegan billboard and bus rear posters in Bristol in Spring 2016, in the month leading to VegfestUK Bristol 2016. Unsurprisingly, as you may expect from a pink fluffy pig, it is Pig Freud’s sincere hope that everyone goes vegan and embraces creative vegan education in their own communities to speed up the process. If you wish to learn more about veganism in a friendly atmosphere with like-minded compassionate people, don’t miss Vegfest Scotland 2016! As one of Europe’s biggest vegan events, Vegfest Scotland consists of excellent food and shopping from 13 caterers and 160 stalls, plus plenty of useful, accessible information from dozens of talks, cookery demos, a Vegan Health Summit and a Vegan Activists Summit, alongside family fun with the kids activities and a Mature Zone, and entertainment from musicians and standup comedians. Tickets for the event will go on sale from September 1st 2016 at the event website www.vegfestscotland.com.